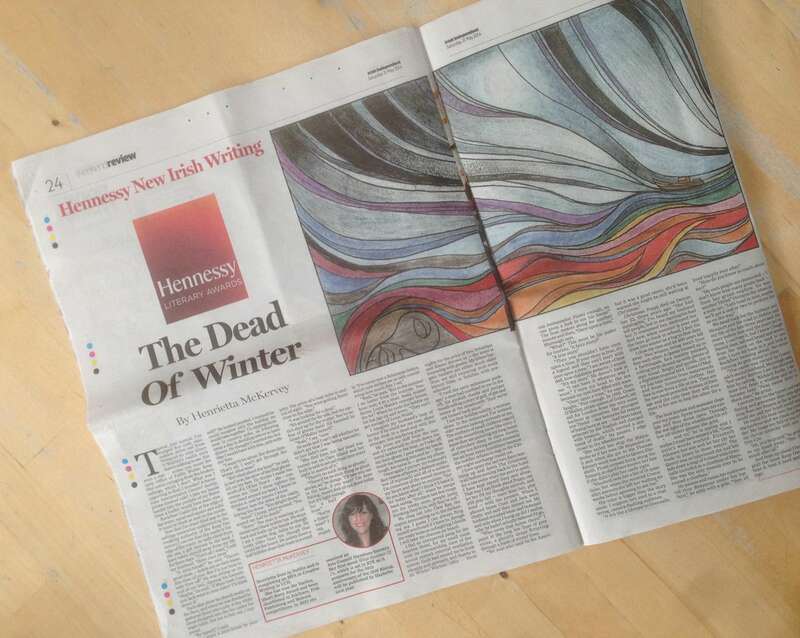 I’m one of 18 writers shortlisted for the Hennessy New Irish Writing Awards 2014. The shortlist was announced in The Irish Times today – January 24th – and there’ll be a big do (what the article describes as a ‘gala ceremony’) on February 24th. This year’s panel are writer Martina Devlin, facilitator Ciaran Carty and author Xiaolu Guo (be still my beating keyboard: I have a big writer-crush on her, since I read Twenty Fragments of a Ravenous Youth in 2008). There are few outlets for short stories, and even fewer that publish so consistently and with such a profile as New Irish Writing. Just being accepted for it was a big deal for me; getting this far is extra jam on the bread. Formerly in the Irish Independent, New Irish Writing is moving to The Irish Times. So many Irish writers got an early (or even their first) run out in New Irish Writing – the list includes Mary Costello, Patrick McCabe, Deirdre Madden, Neil Jordan and Sebastian Barry, as well as one of my favourites Éilís Ní Dhuibhne. She is going to be presented with the Irish PEN Award for Outstanding Contribution to Irish Literature 2015 in February. My story, The Dead of Winter, was published in May last year. It was inspired by the sight of Rockfleet Castle, in Co Mayo, on a wet summer day in 2013. We were on a boat tour of the bay with a clatter of kids and friends on a rainy summer holiday. Dark and inaccessible, the castle had a solid dignity that stuck with me. Then I came across Granuaile and her meeting with Queen Elizabeth in a book of my daughter’s about pirates. Four hundred years ago two of the most powerful people in Europe were women. I find the story of the only time they met very moving, because the reason for that meeting wasn’t power or status; it was love. I took Éilís Ní Dhuibhne’s folklore module on the creative writing programme in UCD, and an exercise she gave us was to use folkloric motifs and structure. I remembered that boat trip, and Granuaile, and wrote the story in response. Typical, just typical. I’ve trudged five cold, rain-sodden miles out from Newport to visit Grace O’Malley’s castle only there’s nothing to see. Not even a sign – unless you count the tatty Office of Public Works: Keep Out notice swinging from the broken railings, which I don’t. What was I expecting to find, I wonder? A boom-time Interpretative Centre? Jaunty, pirate-themed cafe? I jam my hands harder into the pockets of my fleece. Even a leaflet would have been nice. Rockfleet Castle sits at the edge of the water, squat and square and solid. It must be black as soot on the inside. Now that I’m closer (that gap in the railings somewhat undermining the creaking authority of the Keep Out notice) I can see that the castle is the edge of the water: its walls climb from the sea, a gift thrown to the land. I have taken myself away from my life for three days. ‘A mini-break?’ he said. ‘There’s great deals, hotels are on their knees this time of year. But I’m too busy to take time off.’ He was sitting on the end of our bed, clipping his toenails. ‘Maybe… ‘ he said, ‘if Mam took Cuan, and Jack went to your sister? I’ll think about it.’ Each slim sliver he placed neatly on the floor, and when he was finished he gathered them into a pile. A tiny white shoal dropped into the bin under his night table. For me to fish out, I supposed. ‘You want a mini-break by yourself?’ He looked puzzled. I realised he could imagine only the holiday we would take together. Us, sipping Guinness in country pubs; us frittering away a day in deciding where to have dinner. He thought I wanted the holiday I would have with him, only without him. ‘But what about the boys?’ he said, in bed now, the glow of the iPad ghoulish on his face. He thinks I make too much of it. Of her. That it – she – consumes me. That I alone tighten the iron band around my heart. I know he thinks it, and he knows I know. Water laps the sides of the castle, licking the stone. He nods and I can’t tell whether he didn’t get that I was being sarcastic, or just didn’t care. ‘You’re a fisherman?’ I say stupidly. I’ve never met a fisherman before, which now strikes me as odd, considering how much fish I eat. We chug out into Clew Bay, the engine announcing us to the darkening sea. I guess I can always fling myself overboard if I have to, though the water looks so unforgiving I decide I will take my chances on board. I feel an unexpected pang for the Seaview Hotel, for my small room with its commanding view of the leisure centre’s external ventilation system. Guilt had caused me to book cheaply and unwisely, and thanks to its Winter Warmer Offer – three nights for the price of two, breakfast and dinner thrown in – the hotel is humming with guests. My fellow bargain hunters are either much older than me and enjoying mid-week leisure time, or families with pre-schoolers. I am that holiday oddity; a woman alone. In the restaurant I’ve noticed older women looking curiously at me. The mothers of small children regard me with something more like envy: I know they are picturing my long hours of unbroken sleep in clean sheets, and my not driving around aimlessly for an hour every lunchtime because the toddler refuses to nap in the twenty-euro-per-night-surcharge travel cot. I have spent the last two days rambling up and down The Greenway trail before coming back to the hotel for a late swim when the pool is quiet. I have kept myself busy and alone. That way I can think about Poppy, can let her fill my thoughts entirely, and still play fair – more than fair; play kind – with the present. When I phoned home Cuan and Jack were chatty and said they missed me. My husband sounded tense and bemused and only when I hung up did I realise why: he hadn’t actually believed I’d go. ‘Who owns that house there?’ I point at the long low lines of grey stone; a ghostly shape flittering through a bank of winter trees. ‘Yer man who used be the American Ambassador. Funny enough, no-one gives a feck to see his house.’ The boat motors along for another minute and then, ‘Once upon a time,’ Murrough says. ‘Then you shouldn’t have once upon a time. If your story is true, it’s a legend and they can’t start with once upon a time.’ I am aware of how daft, how childishly pedantic, I sound. I turn my head to the sea because my eyes have filled with tears. He pauses. I edge closer to the wheelhouse. Christmas. Poppy died on December twenty-second, three years ago. ‘She had meningitis,’ I’ve heard my husband tell people, but to me meningitis had her. It consumed her, destroyed her. And now, when summer is over and the boys go back to school, I feel the draw into winter as a tug to that date. I close my eyes and let four hundred years fall away. Two women living men’s lives face each other. A Queen trussed up in a farthingale, face harshly painted, rotting teeth shored up with pieces of stale bread. Bright and garish, she is a flightless tropical bird. Grace O’Malley has hair woven from waterweeds and loose, homespun clothes. Her face is raw from a life at sea. They are the two most powerful women of their age and the only time they will ever meet is for one to beg the other for a life. The boat lurches and seawater slops over my jeans. Spray touches my eyelids and they shoot open. Through the wet light of the wheelhouse his yellow oil slicker gleams like gold. We head back for the harbour and Newport and the road to Dublin and my life of the last three years and the years before that and the years yet to come. I can’t see it, but I know Croagh Patrick rises, tall and broad and severe, from the mists on the land to one side. I turn my back to it and look at Rockfleet looming ahead, the moon turning its grey stone to silver. The castle was owned by Granuaile’s second husband, Murrough says, but under Brehon Law she divorced him by calling Richard Burke, I dismiss you, from a window and lo! it became hers. ”Twas easier done in them days,’ he grins. I picture her on the turret, red hair fizzing and gossamer-thin nets spinning from her fingers as far as her eye could see and her heart could want. And from up ahead I hear the wind grab the loose Keep Out notice and beat it, beat it hard against the railings.